The newest lodge at Wildside Lodges, Eagle is a larger than average riverside lodge, beautifully situated alongside the river. This lodge has stunning views towards the mountains with a private aspect from the large floor to ceiling patio doors, taking full advantage of the fantastic scenery and the many visitors to the bird tables. The lodge is fully central heated and in addition a wood burning stove for those cosy family evenings. An open plan aspect throughout the kitchen, dining room and lounge with Patio doors out to the decking area. Panelled walls and traditional highland tartan theme which is continued in every room of this beautiful lodge. The Lodge has views across the lawns to the mountains where you can spot an abundance of wildlife, from deer stags to pheasants. The lounge has a chic chesterfiled leather sofa and comfy tartan armchair, together with chunky oak furniture. TV with 32” Led flat screen colour television and DVD Player, “free DVD hire at reception”. The log fire adds atmosphere to this cosy family lodge or romantic retreat. A selection of books and games and tourist information pack is available in the lodge with details of local attractions and events. From the lounge is a large dining table with Highland Tartan chairs and a large overhanging light for atmoshphere. Off the dining area; a luxury fitted shaker style kitchen is equipped with electric cooker and microwave oven, fridge, freezer and dishwasher. The kitchen is fully equipped and the cupboards are stocked with Churchill crockery, non-stick pans, cutlery, glassware and cooking equipment, everything you need for a self-catering holiday. This lodge has matching soft furnishings and is decorated to the highest standard throughout. Luxury Modern bedrooms both have comfortable beds with deluxe mattresses, warm hollow fibre duvets and pillows and fresh linen. Modern Painted shaker style Double wardrobes and drawers provide adequate storage. The main bedroom has a double bed. The second bedroom has twin beds and both with matching furniture and Highland themed accessories. The bedrooms both have patio doors on to the decking and hot tub area. A travel cot and high-chair are available on request. The Double bedroom has a luxury ensuite with a large powerful walk in shower with luxury bathroom fittings. Towels, bathrobes, slippers and bathmats are provided. Heated towel radiator. You will also find a family bathroom located near the twin bedroom, with bath and ovehead shower, panelled walls and wet walling and luxury fittings. 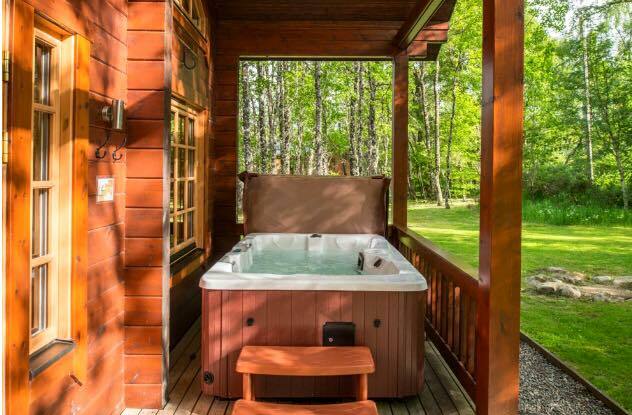 The lodge is south facing with a a large wrap around decking area with hot tub, private lawns, a picnic bench is provided to enjoy the beautiful setting. A barbecue with charcoal is available for your use .